The entire list of bugs handled in this release is also available via the 1.5 milestone on GitHub. Note that as always it takes some time for Mozilla to review the new version, but it's available on the all versions page immediately. 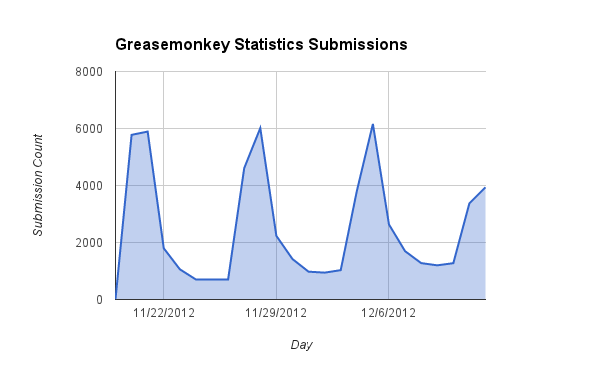 In release 1.5 Greasemonkey will add anonymous statistic gathering. This feature will be opt in only. Users will be asked to opt in, but no data will be transmitted unless they do. For users that do opt in, a randomly generated persistent ID will identify this Greasemonkey installation as being distinct from others, and then certain data will regularly be gathered and transmitted to a central server for analysis along with this ID. 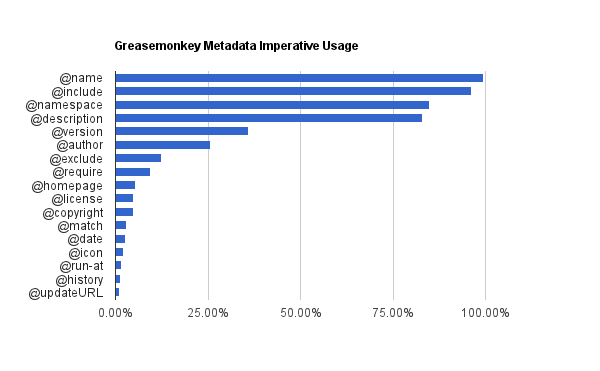 The goal is to improve Greasemonkey by better understanding how real users go about using it. To control this feature, a new check box is being added to the Greasemonkey Options dialog. If you opt yourself in and later want to opt back out, or vice versa, you can use this check box. 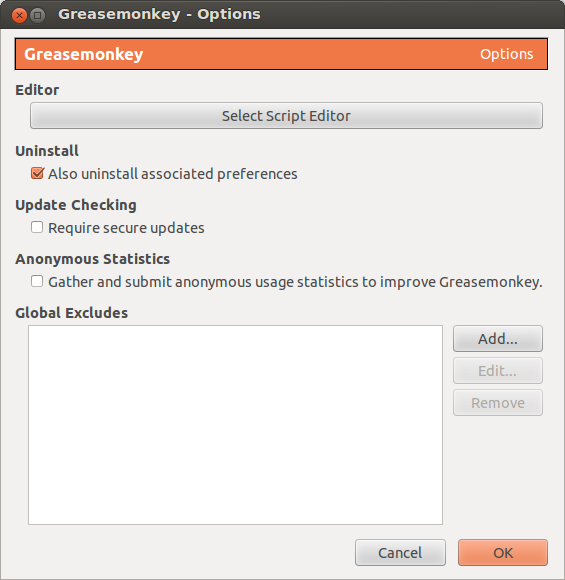 The Greasemonkey Options dialog can be found through the monkey menu, in Tools > Greasemonkey > Greasemonkey Options, or the Preferences button for Greasemonkey in the Add-Ons manager. Back in November 2009, I analyzed the API usage, and a few other aspects, of all the scripts on userscripts.org, then 36,141 scripts. I was directly discussing some of the topics that were already bubbling around the back of our minds, for how to carry Greasemonkey into the future with us. The short version is: web browsers and web apps are getting so much poweful, why do we need these one-off Greasemonkey APIs with cross-browser problems? Now that Greasemonkey 1.0 is out, we've made big steps made in that direction, and I've repeated the analysis. 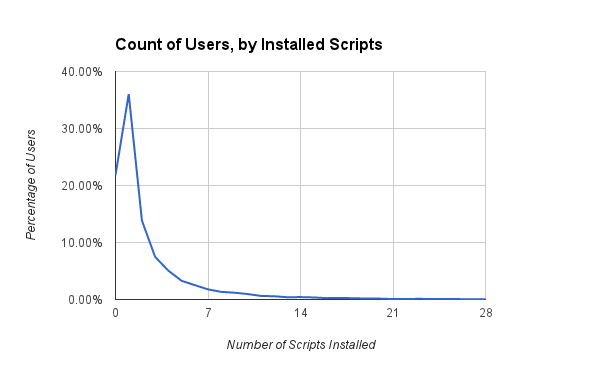 I downloaded (with permission from the site owner) every single active script on userscripts.org, now 82,084 scripts. First up, which API calls are made, and how common are they? Not much has changed. By far most common is that a script doesn't call any special APIs (57.94%). Then, GM_getValue/GM_setValue are still right up there. The biggest change is that unsafeWindow usage has jumped from 6th to 2nd place (12.44% to 17.65% of scripts; 1,527 scripst also mention wrappedJSObject, not on the chart). Authors want to interact with the page in ways that the security sandbox (which protects these APIs) prevent, so they explicitly jump out of the sandbox, bringing vulnerabilities with them. 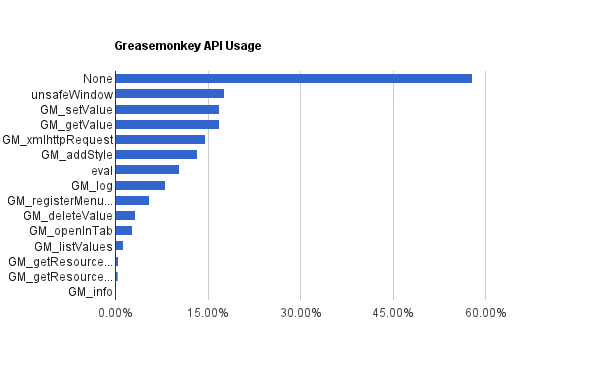 Of the 14,484 scripts that reference unsafeWindow, 6,494 of them use no other Greasemonkey APIs, and thus are served well by moving towards a model where there is no sandboxing (nor APIs, unless you ask for it/them). Another 838 scripts only use GM_log and/or GM_addStyle, which can easily be replaced with console.log() or the compatibility shim layer. It gets hard to analyze other calls in more detail, but I see a lot of get/set value calls, which (assuming you run on only one domain) can also be well served by DOM Storage. Moreover, those 47,557 scripts that don't use any of the special APIs are still saddled with the sandbox and its pitfalls, known and unknown before Greasemonkey 1.0. Plenty of newer browser features don't work in the security sandbox because its entire point is to separate the content scope (where these features work) from the script scope (with its smaller set of privileged features). A huge part of the design changes in Greasemonkey 1.0 is to make the default behavior, like these majority of scripts need/want, to run as close to possible as a regular script in a regular web page, without surprises like missing values and broken features. So do scripts that use get/set value or xmlhttpRequest really need the cross-domain behavior they provide? Mostly: no, and this hasn't changed much since 2009. The vast majority of scripts using get/set value (71.86%) only ever execute on a single domain, and thus can use DOM Storage with no ill effects. 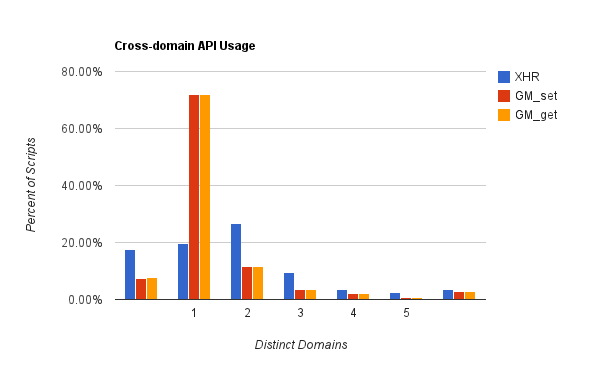 The XHR usage to two domains is lower mostly because I fixed my analysis a bit (i.e. not counting an @include of *.example.com and an XHR to www.example.com as two domains, and not counting XHRs to userscripts.org, assumed to be update checker scripts, which is now provided by Greasemonkey). However, a combined 44.25% of scripts that call XHR (and with a string literal that I could pull a domain name out of, not a variable set somewhere else) either call to/run on two or all domains, and thus really use the cross-domain power of GM_xmlhttpRequest. Finally a bit more detail about Metadata imperatives. This graph is for all imperatives used in at least 1% of scripts, regardless of what they are. Most of what has changed since 2009 is the analysis, including more values. Note that almost every script (99.37%) specifies @name, and we see a power law trail off in usage. The commonly used, but unsupported in Greasemonkey, ones are @author, @homepage, @license/@copyright, @date, and @history. Check the raw data to see hundreds more @things, generally all unsupported values. And there I pasted only those used at least ten times, there are yet more hundreds used fewer times. To those that are interested: the script that I used to generate these numbers is available for inspection, in case it perhaps contains a serious bug. The raw data that I generated with it, and the charts above, are also available to check. 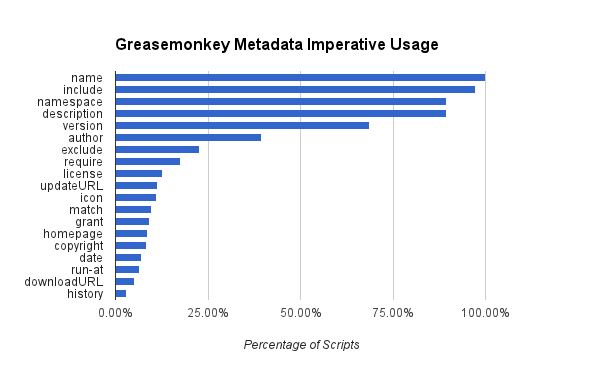 One of the big changes behind Greasemonkey 1.0 was moving towards the goal of not forcing the security sandbox (and all its pitfalls) upon script authors. This is the entire reason for @grant, and specifically the @grant none setting. In the @grant none case, the script does not get the traditional security sandbox (with XPCNativeWrappers), but rather a very thin sandbox that exclusively acts as a private scope, to hold variables for the script that don't interact with the page. The idea was, if you want to set something in the page, you just do window.foo = 'bar', and if you don't it's just a normal var foo = 'bar'. But there's a problem. If you @require jQuery, it implicitly does a window.$ = window.jQuery = ..., which exports the copy of jQuery that your script is loading into the page. If they're different versions, there is a very real possibility of completely breaking the page. This line just calls the standard jQuery noConflict() method, so that this loaded version of jQuery doesn't conflict with anything already in the page. It's already there, it's exactly what it's for! And saves a local (in the script) reference to the version of jQuery that you want to use. This should let your script keep working, and also keep the page from breaking. It's only lightly tested so far; let us know in the comments if it helps you. After more than seven years, Greasemonkey has finally grown to version 1.0. Back in August of 2005 (almost exactly seven years ago now), Greasemonkey introduced wrappers intended to plug security holes. As a result the common pitfalls were born. Ever since then, in order to write a user script that would function properly in Greasemonkey, authors were required to either get lucky and not trip over one of these pitfalls, or get lucky and figure out that they exist -- and how to work around them. The entire list of bugs handled in this release is also available via the 1.0 milestone on GitHub. A number of issues listed there only affected Greasemonkey during the development of version 1.0, so they aren't listed as changes below. As always, if you notice problems, it's best to log an issue at GitHub or let us know at the greasemonkey-dev mailing list (and be clear that your issues are with this version).